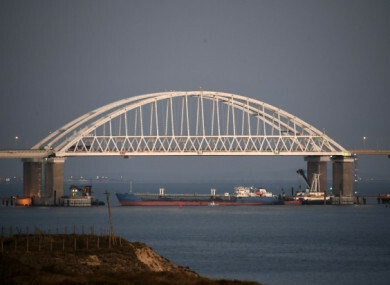 The Kerch bridge which was blocked during the incident. UKRAINE HAS BARRED Russian men aged 16-60 from entry as tensions mounted between the two countries over Moscow’s seizure of three Ukrainian ships last week. The move came after Kiev imposed martial law in border regions this week in response to the Russian seizure of the ships and 24 sailors off Moscow-annexed Crimea. The incident was the most dangerous in years between the ex-Soviet neighbours – who are locked in conflict over Russian-backed separatist regions – and has raised fears of a wider escalation. “As of today, entry is restricted for foreigners – in the first instance for male citizens of the Russian Federation age 16 to 60,” the head of the border service Petro Tsyhykal said at a meeting with President Petro Poroshenko that was broadcast live. Poroshenko said the restriction will not apply to “humanitarian cases”. Moscow slammed the move, but said it will not impose similar restrictions on Ukrainians. Russian foreign ministry spokeswoman Maria Zakharova said the decision was part of the “ill-conceived, wild direction” of the Ukrainian leadership. She told a press briefing that to try and mirror the travel ban “would lead to some kind of insanity”. Belarus, which has become a transit point between the two countries since direct flights between Kiev and Moscow were suspended in 2015, said today that Ukraine had barred entry for 144 Russians this week. “Different airports in Ukraine banned entry to a total of 50 Russians arriving from Belarus in one day,” a representative of the Belarusian border service told Russian agencies. Moscow and Kiev have traded angry accusations since Russian navy vessels fired on, boarded and captured the three Ukrainian ships last Sunday. Courts in Crimea sentenced the 24 Ukrainian sailors to two months detention, despite international calls for their release. Russia insists they crossed into Russian waters illegally, with Putin saying the border guards “fulfilled their military duty” in seizing the ships. Crimea’s human rights ombudsman Lyudmila Lubina told Russian media that the sailors have been transferred from Crimean jails to Moscow. Ukraine has called their detention “illegal”. Kiev imposed martial law for 30 days in 10 regions that border Russia, the Black Sea and the Azov Sea on Wednesday. The decision came after Poroshenko warned of a build-up of Russian tanks near Ukraine’s borders, escalating the most dangerous crisis in years between the ex-Soviet neighbours. Ukraine, which has said it fears it is now under threat of a “total war” from Moscow, this week launched military drills in the Sea of Azov, with soldiers role-playing repelling a Russian attempt to land on the coast. European leaders this week rebuffed calls from Ukraine for greater support against Russia, after Kiev urged NATO to send ships into waters disputed with Moscow. German Chancellor Angela Merkel asked Kiev to be “sensible” following the request from Poroshenko, just hours after the European Union failed to agree to threaten new sanctions against Moscow. Ukraine has also urged Western governments to impose more sanctions on Russia over the incident. EU President Donald Tusk said today he was “sure” the bloc will roll over its sanctions on Russia next month because of Moscow’s “aggression in Ukraine”. “The escalation in the Sea of Azov is a cause of great concern to us. Russia’s use of force against Ukrainian ships is unacceptable,” Tusk told reporters before the start of the G20 summit in Argentina. “Europe is united in its support to Ukraine’s sovereignty and territorial integrity. This is why I am sure that the EU will roll over sanctions against Russia in December,” he added. NATO spokeswoman Oana Lungescu said the issue would be raised at next week’s regular meeting of alliance foreign ministers in Brussels, where Ukrainian Foreign Minister Pavlo Klimkin is also expected. Email “Ukraine bars Russian men aged 16-60 from entry to country as tensions mount over ships seizure”. Feedback on “Ukraine bars Russian men aged 16-60 from entry to country as tensions mount over ships seizure”.